The growing use of semiconductors in daily life has prompted the search for new materials, as well as gaining more efficient synthesis techniques with a broad range of technological applications, thus becoming a field of research in the perimeter of basic and applied knowledge. Specifically, one of the most stimulating groups of semiconductors is the group of mixed tungsten oxides, which are a class of multifunctional materials with ground-breaking chemical and physical properties that span a wide range of applications. At the same time, of late, investment in research to find efficient bactericidal agents has grown. Scientists of the departments of Physics, Inorganic and Organic Chemistry and Physical and Analytical Chemistry of the Universitat Jaume I, the Functional Materials Development Centre of Brazil and the Technical University of Liberec (Czech Republic) have formulated a new method to obtain complex nanocomposites created by metallic silver nanoparticles doped in crystal of silver tungstate semiconductor that enhance 32 times their bactericidal performance. 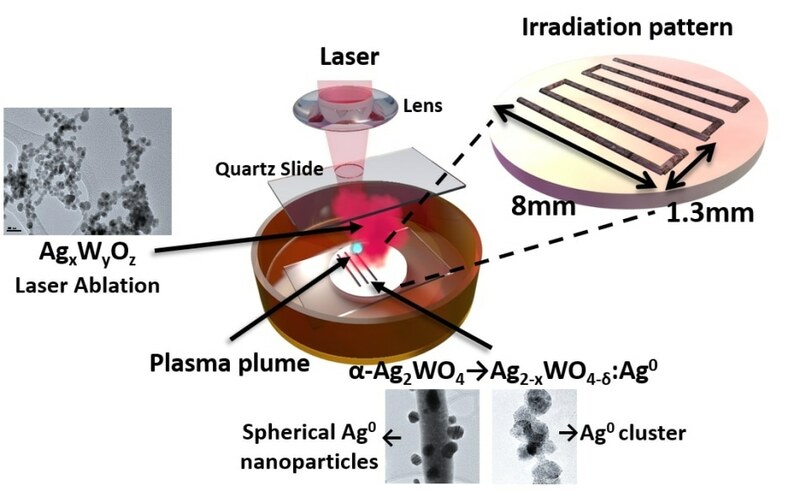 The research team recently published the paper “Towards the scale-up of the formation of nanoparticles on α-Ag2WO4 with bactericidal properties by femtosecond laser irradiation” in the journal Scientific Reports (Nature), in which they describe a new synthesis method based on the irradiation of light on the surface of the semiconductor in a very short time, precisely in femtoseconds (10-15 seconds). This method allows the isolation of metallic silver from the semiconductor forming silver nanoparticles on the surface. The semiconductor draws the bacterial agents and the nanoparticles of silver neutralize them. This silver tungstate is highly bactericidal when applied to a colony of bacteria, about 32 times more effective than the materials used so far." In this manner, the interaction between the semiconductor and pulsed laser radiation in femtoseconds makes way for possibilities in discovering high performance and easy-to-manufacture bactericidal compounds, since ultra-short laser irradiation can be easily incorporated into the production process. Research has also exposed that laser-driven synthesis offers a rich diversity of chemical species, such as red cloud species or black species. The finding increases the vital knowledge about the effects of the interaction between laser and matter, while also being a stimulus for the efficient synthesis of nanocomposites. The research team works on the capability to alter the effect brought on by the laser by varying its power and the time of irradiation that could open a new domain in the synthesis of unique materials with a wide variety of photoswitch or photocatalytic applications in fields such as technology or medicine.